The Ulster Grand Prix and the Ulster Grand Prix Supporters Club will be organising a coordinated response to the Planning Appeals Commission's letter received. Thank you to everyone who has made an enquiry about the recent letter that members and supporters have received from the Planning Appeals Commission. To continue to support our ongoing objection to the proposed cemetery on the Ulster Grand Prix circuit, we are happy to act as Agents on your behalf- if you so wish. For your convenience, simply print the attached letter and fill in YOUR details in the first box. Indicate you OBJECT to the planning. submit a Statement of Case when requested to do so. Note the closing date for returned forms is 4pm on Thursday 11th April. Next year’s UGP road races are to be held on the 5th and 10th August, the organisers have announced. Four Ulster GP races are again scheduled for Thursday 8th August, including the first of the meeting’s three Superbike races, plus Supersport, Ultralightweight/Lightweight and Supertwins classes. Seven races will run on Saturday 10th August including; Superstock, Supersport, Ultralightweight/Lightweight, Superbike, Supersport, Supertwins and Superbike. Bike Week starts on 5th August, with practice sessions for all classes two days later on Wednesday 7th August and on the morning of Thursday 8th August, before the race programme begins. 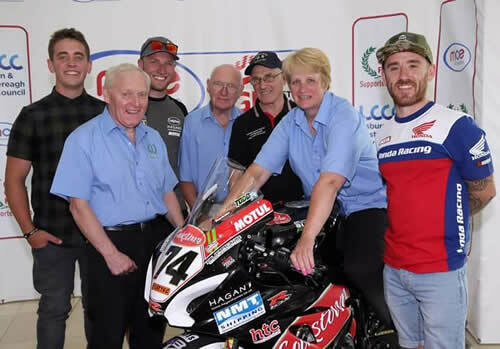 Clerk of the Course Noel Johnston said: “My key message for everyone, but specifically newcomers, is that Dundrod is an extremely fast and technical circuit which must be treated with respect, and that means doing a serious amount of groundwork before taking your place on the grid. “Unfortunately, this year we had less than perfect weather conditions and had to delay and abandon some of the races on the Saturday. We were gutted for the fans and all the teams and riders that had travelled over for the event, it was very unfortunate after all the hard work that had been put into the event. “With that said, we are looking forward to welcoming the tens of thousands of motorcycling fans from across the globe, that will descend on Dundrod for the 2019 UGP Bike Week. “It’s always close racing and the track is a firm favourite among fans and riders alike, but there is so much more to enjoy during Bike Week, as it is five days packed with full of entertainment and activities for all ages. Dundrod and District Motorcycle Club welcomed Lisburn and Castlereagh City Council Planning Committee’s unanimous rejection of the proposed 96-acre super cemetery, on the Ulster Grand Prix Circuit. 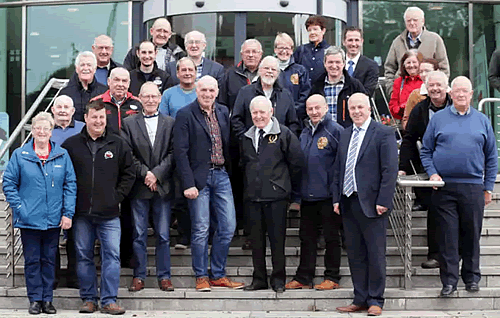 photo: Dundrod & District Motorcycle Club, The Ulster Grand Prix Supporters Club, and local Dundrod residents pictured outside Lisburn and Castlereagh City Council’s Office following its unanimous rejection of the proposed 96-acre super cemetery, on the Ulster Grand Prix Circuit. Des Stewart, Chairman of the Ulster Grand Prix Supporters Club, said there had been a groundswell of opinion against the cemetery among race fans: “More than 3,000 objection letters to the plans were handed over to Lisburn and Castlereagh City Council in 2016, signed by The Ulster Grand Prix Supporters Club, the Dundrod & District Motorcycle Club, promoters of the Grand Prix and the vast majority of local residents, who were united in their opposition to the planned cemetery site on Quarterland Road, Dundrod. 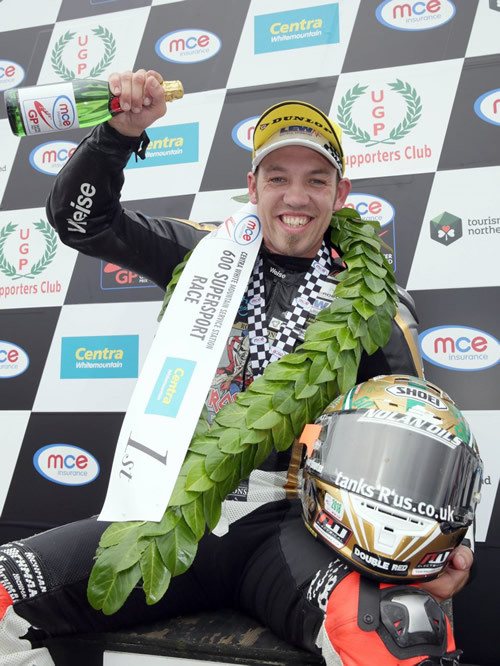 The Ulster Grand Prix is one of the biggest annual outdoor events in Northern Ireland, attracting tens of thousands of visitors from across the world. The economic impact is significant; spectator spend alone generates an estimated £2.5 million every year, and there are more than 10,000 commercial bed nights. “The sheer volume of objections to the unpopular planning application and the packed gallery at today’s hearing, demonstrates the support and important social, cultural and economic impact the Ulster Grand Prix has in the area and to Northern Ireland tourism,” Mr Stewart added. The inherent conflict between the economic benefits of the cemetery proposal and the existing benefits of the Ulster Grand Prix road racing event were weighed up by The Council Planning Committee and it was concluded that after the construction phase of the cemetery, economic benefits would be limited. Apart from the potential negative impact the proposed cemetery might have on the Ulster Grand Prix, the application was also rejected on the basis that the nature, scale and lifespan of the proposed development is considered excessive and unacceptable. The consultation process did not secure support from surrounding councils and it was not demonstrated that the additional burial capacity is required to meet the needs of the council area. Lending his support Alderman James Tinsley, Lisburn & Castlereagh City Council said: “Dundrod sits within my constituency, I am in total agreement with local residents and Dundrod & District Motorcycle Club that this plan is not viable. “From day one local residents told the applicant in no uncertain terms that the proposal was not acceptable to them, due to the unsuitability of the site, road infrastructure, the area’s propensity for inclement weather and the harm it would cause to the local area and community. Noel Johnston, UGP Clerk of the Course added; “We are pleased with the unanimous decision taken today by The Council Planning Committee to reject the cemetery in favour of the planning officers’ recommendation for refusal. Bike Week 2018 gets underway next Sunday, so make sure you check out the packed schedule to see what's happening every day. As well as all of the on track action there will be quizzes, grass track racing, motorcycle convoys and much more! Well done everyone! All prize winners have been notified.